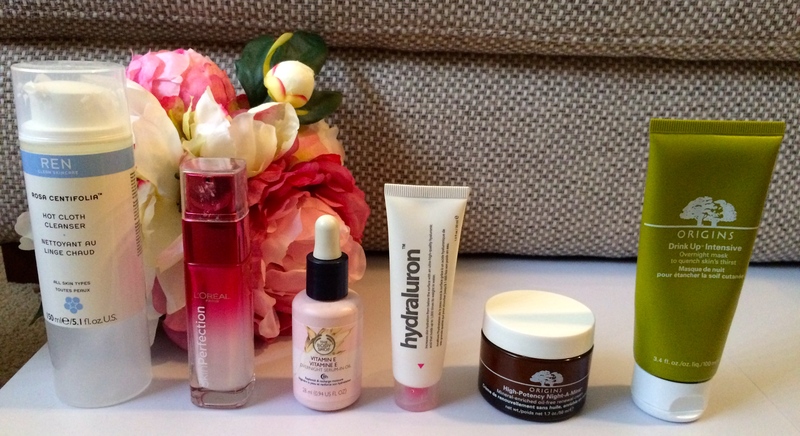 I try so hard with skincare, but sometimes I’m really not sure what I’m doing! So lately I’ve been reading up on skincare on Caroline Hirons website trying to get a real understanding of what my routine should be and heres what I’ve got so far. 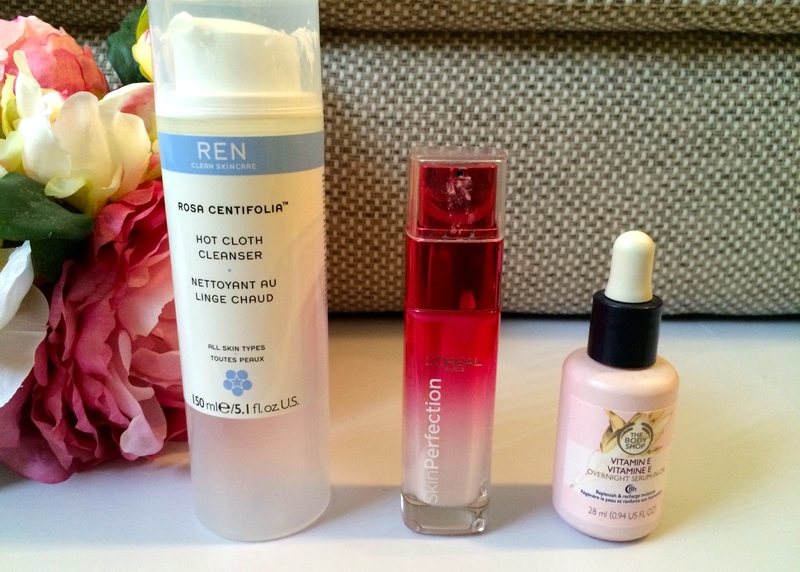 My first step is using the Ren Rosa Centifolia Hot Cloth Cleanser to thoroughly cleanse my skin. If I’m wearing a lot of makeup I will take that off with the Garnier Micellar Water first, I’m sure many people would double cleanser with the Ren cleanser but to be honest I don’t have enough money to go through it that quickly! Next up I use a serum the Loreal Skin Perfection Serum this really smooths my skin out and is a great light layer to add to my skin first. This one is pretty much finished but I’m not really sure weather I should repurchase this or try something else. After this one I use a fairly new product to me, something I bought in India to save my skin after some serious neglect. Its The Body Shop Vitamin E Overnight Serum-In-Oil – I’d never really though of using an oil on my skin before seen as I would call myself a very oily girl however, after the disastrous state it was in after India I was willing to try anything! I’ve been using this consistently for a month now and I really do think I am seeing a difference, my skin is smoother and more plump and its slowly, slowly getting rid of my dry patches on my cheeks. After the oil comes another serum because apparently two are not enough! So I use my Indeed Laboratories Hydraluron – Caroline said that hydroluron is the last step as it is quite thick, at this stage I’m not sure whether this itself is making a difference to my skin or whether its a combination of everything so I think i’ll just keep using it as it seems to be working with everything else. Finally I use a night time moisturiser its the Origins High Potency Night-A-Mins – I love this night cream because it isn’t extremely thick! Most night creams I’ve tried are ridiculously thick and I just find them suffocating but this is lovely and light and sinks into the skin immediately. Now for bonus time! 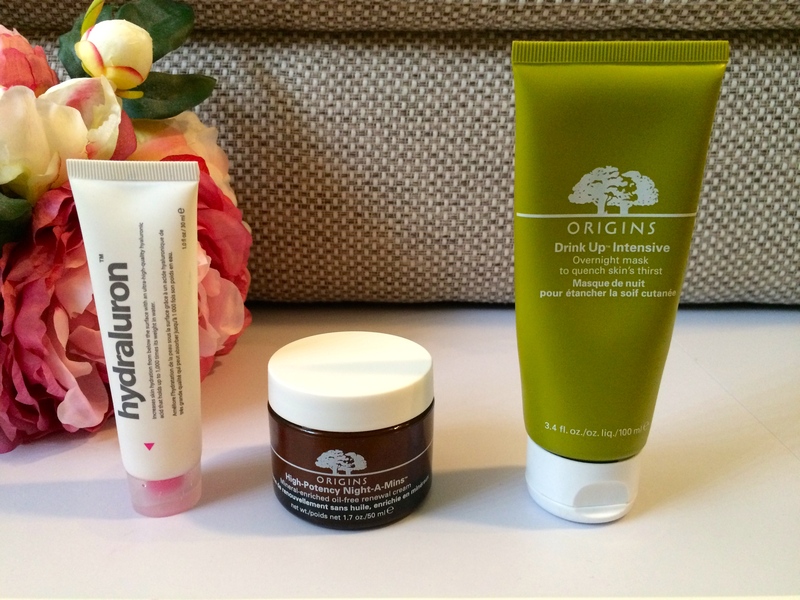 Two or three times a week I use the Origins Drink Up Intensive Overnight Mask – this gives a major shot of moisture! You put it on that night and wake up with baby soft skin that looks beautifully plump. As I am not expert in the skincare world I’m still not sure if I’m doing this right so If you have any tips or suggestions I would much appreciate it! « What I’ve Been Wearing This Week!